Cloud storage is the latest means to store your digital content, but if you still wish to be connected to the traditional means then nothing like DVDs. Storing your favourite movies, videos, images, music and other content on DVD frees up some space on your computer and gives you a physical sense of belonging when it comes to your important data. Additionally sharing content becomes much easier when they are stored on a DVD. Thus in all the above-mentioned situations, you would need a DVD maker that will help to copy your data to a DVD. There are a number of DVD makers from which you can pick the one that meets your requirements. The article below will help to resolve your queries on various related issues like how to make bootable DVD, how to make a copy of a DVD, how to make a DVD menu, and others. Looking for a free solution to create DVDs on your Windows system? Windows DVD Maker will prove to be an apt choice. 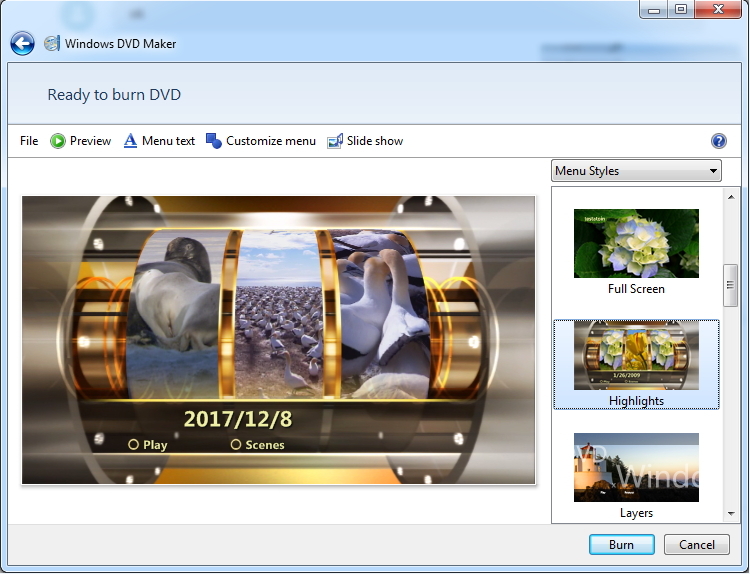 This DVD Maker Windows is included only in Windows 7 and Windows Vista system while it is not supported by Windows 8 and Windows 10. In addition to videos, photos are also supported by the program as an input option, thus making it a decent photo DVD maker as well. Good quality slideshows and home movies on DVD can be created using the software. 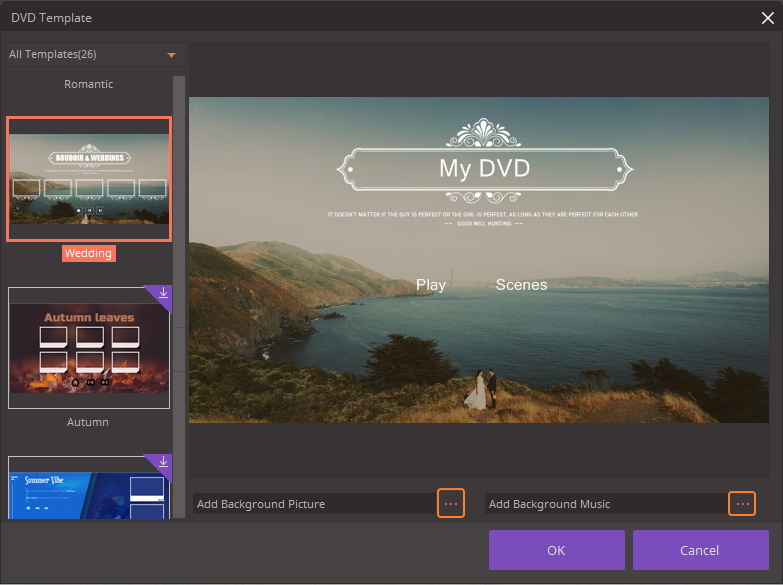 To help to personalize your videos, this DVD maker Windows also supports a host of editing features like adding DVD menus and background music, font and button style customization, adding slideshow transition effects and others. Thus it also works as a decent DVD slideshow maker. For better settings and effect, an interactive preview option is also there. Step 1: On your Windows 7/Vista PC, open Control Panel> Programs and Features. Hit the “Turn Windows features on or off” option and move down to “Media Features”. Check the box next to Windows DVD Maker. Once the program is installed, you may need to reboot your system and Windows DVD maker download process will be complete. 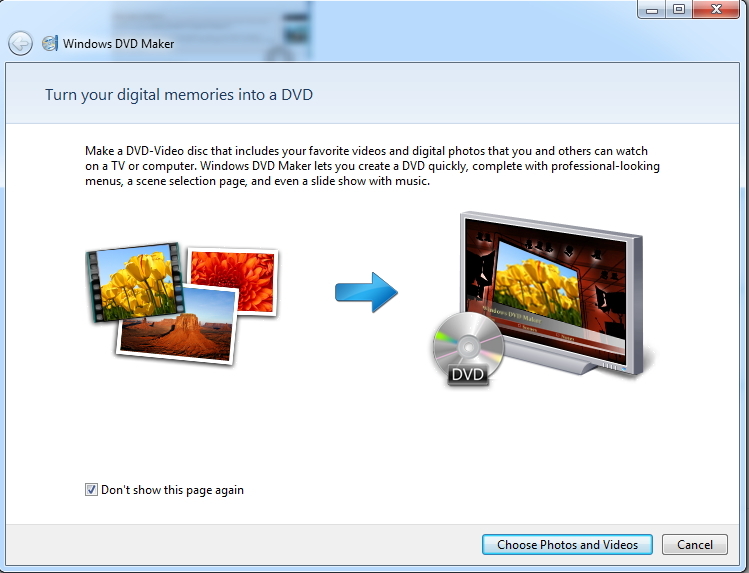 Step 2: Open the DVD maker Windows 7 or Vista and click “Choose Photos and Videos” to browse and add media files that you want to convert to a DVD. Step 3: Once files are added to the interface, you can manage them by adding or removing. Click “Next” to proceed further. Step 4: You can preview, add menu text, customize menu and select slideshow option. Select the menu style of the DVD and finally hit “Burn” to make a DVD. This Microsoft DVD maker will create DVD of your selected files. Windows DVD Maker is only compatible with Windows 7 and Vista OS. But for the Windows 10 system, Microsoft comes installed with Windows Media Player. Using Windows Media Player for creating DVD has a lot of restrictions as the program only allows WMV, WMA, JPEG, and MP3 as the input file option. Moreover, it also allows creating the supported formats for limited disc type- 4.7GB Data DVD readable on PC and a few DVD players. Thus if you want to convert other formats to DVD that can be played on a number of players, a third party application will be needed. There are a number of software and programs that can make bootable DVD, and if you are in search for the best alternative, then Wondershare UniConverter (originally Wondershare Video Converter Ultimate) is the apt choice. This video DVD maker is compatible with Windows and Mac system and is a powerful all-in-one DVD toolbox. The software allows editing, converting and burning DVDs in a few simple steps. The key features of the software are enlisted below. Helps in burning videos to DVD folder or ISO files on the local disk. Supports an array of formats for converting them to DVD. Facilitates setting free DVD menu templates with various themes, customized background music, image. Super fast DVD burning speed. Once you complete the process of this DVD maker download, install it on your PC/Mac and follow the below given steps. 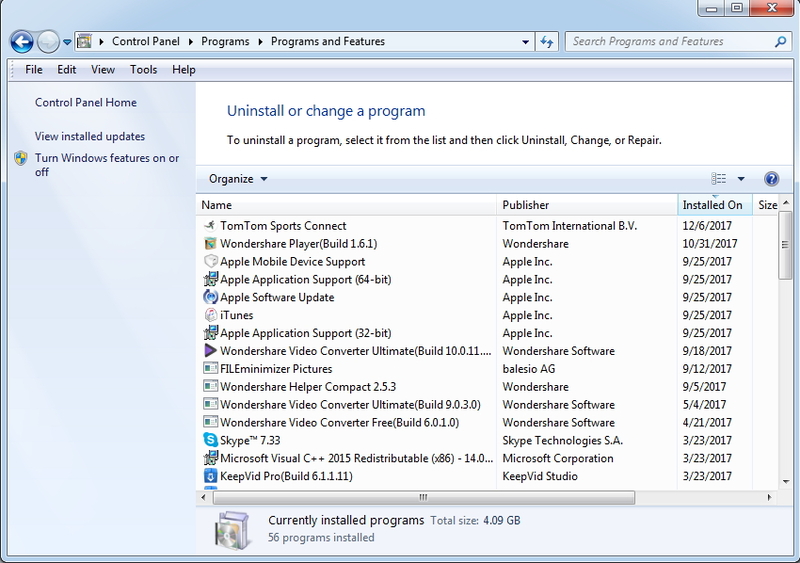 Step 1 Open Wondershare UniConverter (originally Wondershare Video Converter Ultimate) and add file(s). 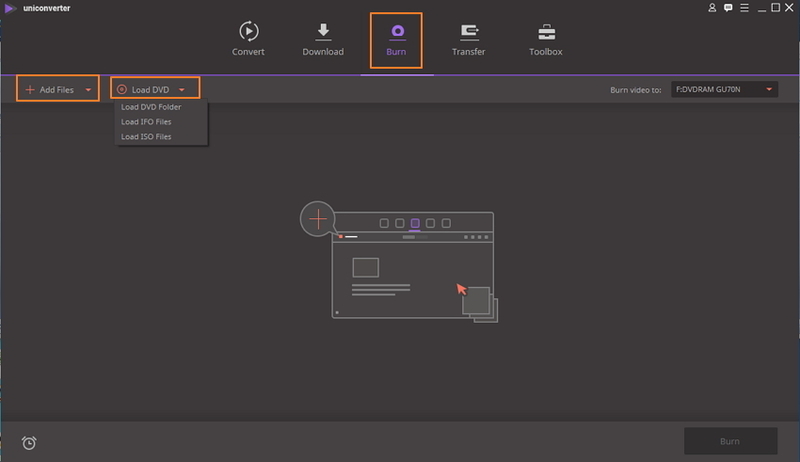 Launch Wondershare DVD maker on your PC/Mac. On the main interface select the Burn tab and click +Add Files to browse and add the files from your PC. Alternatively, you can also add the converted files, downloaded files or load files from other DVD. Step 2 Set DVD settings and select DVD templates. 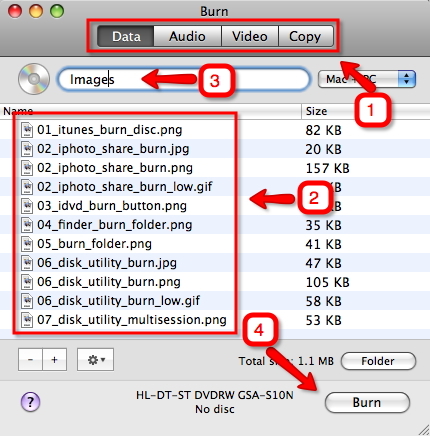 Once files are added to the program interface, select the folder where you want to burn the video at Burn video to: tab, here you choose the DVD. Then, select your DVD type: DVD5, DVD9, BD25 or BD50. After that you can select the template from the given options. Move the right and the left arrow to check the options. For adding background music or image, open the DVD template window by clicking Edit icon. After that, adjust DVD settings for various parameters - menu type, aspect ratio, TV standard, and quality. With these features, Wondershre DVD maker also works as a DVD label maker. Step 3 Start burning video to DVD. After all the settings have been finished, finally, click the Burn button to start the process. With its host of features, quick speed, and simple burning process, Wondershare UniConverter (originally Wondershare Video Converter Ultimate) proves to be the best DVD maker. There is no dearth of DVD makers for Mac system, but working with a professional program offers not only good quality backup but also hassle-free process. So if you have been hunting a DVD maker for Mac, you are on the right page. We have picked up the top programs and software to make DVD on Mac. Read below to know more about these tools. 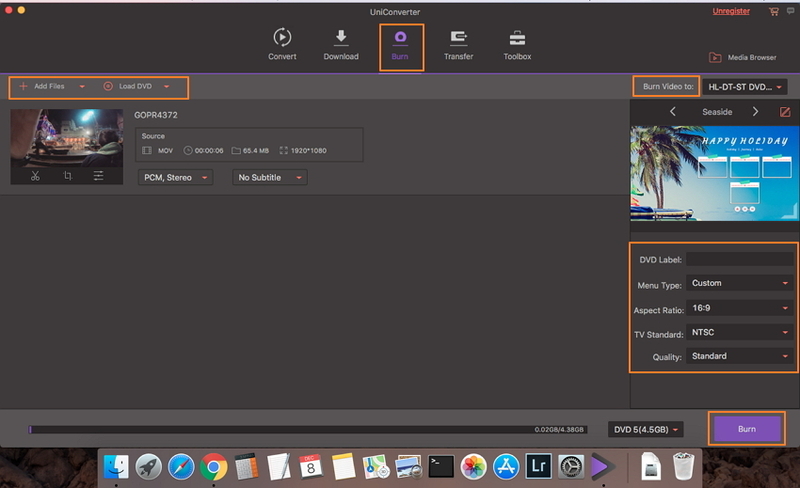 One of the best programs to take care of all your DVD related needs on a Mac system is Wondershare UniConverter for Mac (originally Wondershare Video Converter Ultimate for Mac). The program acts as a complete DVD took-kit with an array of professional features. Wondershare UniConverter (originally Wondershare Video Converter Ultimate) supports all popularly used formats that can be converted to DVD. The program supports burning HD as well as FHD videos to Blu-ray discs and DVD for TV playback. Helps to create backup of the videos by burning them to DVD. Facilitates burning videos to DVD folder or the ISO files present in the local disk. Free DVD menu templates with various themes can be created. Background image or music can be added. Allows editing the title of DVD by changing its color, size, and font. 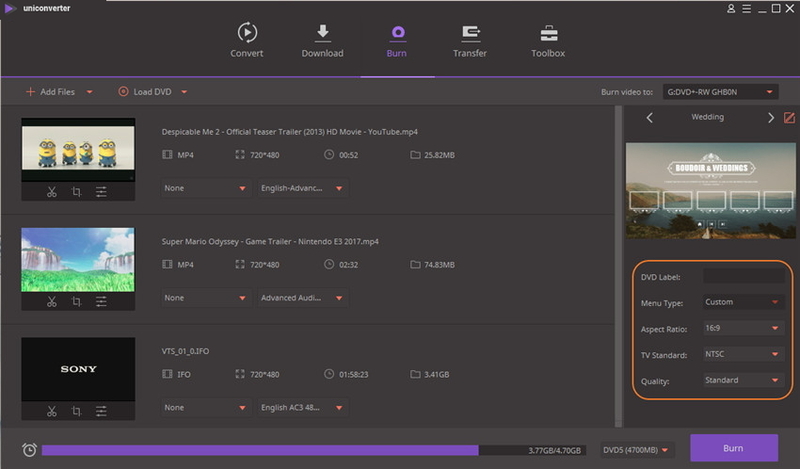 Built-in video editor helps customizing videos before burning it to DVD. Support burning a number of DVDs at a time. Step 1 Open UniConverter (originally Wondershare Video Converter Ultimate) on your Mac. Under the Burn tab, click “+Add Files” or “Load DVD” to add files from your system or DVD. Here you can also add converted or downloaded files. Step 2 After adding files, select template by moving left and right arrow. Step 3 At “Burn Video to:” option, select name of the DVD file. Enter the details for the DVD label and other parameters. Step 4 Click the “Burn” button to start the DVD burning process. If you are looking for a DVD maker online for your Mac system, then you would be disappointed to know that there are no online tools available. Instead, you could go for free DVD maker software that can be easily installed on your Mac system to get your media files converted to DVD for playback and backup. There is a decent number of DVD maker freeware for Mac systems, but one of the popularly used tools is Burn. The program allows burning CD and DVDs on Mac through its simple and easy to use interface. Using the software, you can burn data disks, playable videos disks, and playable CD audio disks. Disk images like ISO, DMG and others can also be copied and written using Burn. Additional features that make Burn as the best free DVD maker include personalizing DVD with custom DVD menu and themes, disc icon option, file permission, file dates, MP3 tag editing, converting files, and others. Burn work on Mac OS X 10.3.9 or higher OS version and is free to use and open source program. 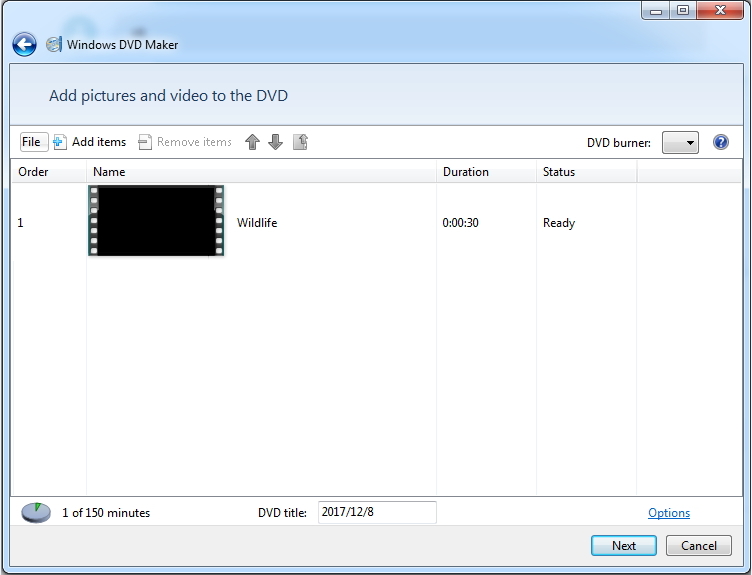 This video DVD maker free can be downloaded from http://burn-osx.sourceforge.net/Pages/English/home.html. Step 1 Download Burn from http://burn-osx.sourceforge.net/Pages/English/home.html and install on your Mac. Step 3 Drag and drop the files that you want to burn to the program interface. Give the desired name to the disc. Step 4 Finally, click “Burn” to start the process. The above methods will surely help you with solutions to your queries on how to make a DVD. You can either opt for free DVD maker Windowsor Mac software for basic requirements or go for professional software like Wondershare UniConverter (originally Wondershare Video Converter Ultimate) for complete DVD needs. Now have a free trial now!